^ Dave Chaffey. Home Page as Landing Page examples. smartinsights.com. [4 September 2014]. ^ 2.0 2.1 Campbell, Jennifer. Web Design: Introductory. Cengage Learning. 2014: 76. ISBN 978-1-305-17627-0. ^ Jakob Nielsen. Top 10 Guidelines for Homepage Usability. nngroup.com. 12 May 2002 [4 September 2014]. ^ Kalbach, James. Designing Web Navigation. O'Reilly Media. 2007: 106. ISBN 978-0-596-55378-4. ^ Schwerdtfeger, Patrick. Webify Your Business, Internet Marketing Secrets for the Self-Employed. Lulu. 2009: 151. ISBN 978-0-557-04901-1. ^ Campbell, Jennifer. Web Design: Introductory. Cengage Learning. 2014: 94. ISBN 978-1-305-17627-0. ^ 7.0 7.1 Boyce, Jim. Windows 7 Bible. John Wiley & Sons. 2011: 318. ISBN 978-1-118-08127-3. ^ How do I enable directory listings for a folder on my Web site?. tigertech.net. [4 September 2014]. ^ Jack Schofield. 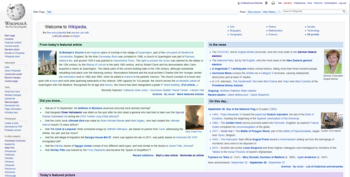 iGoogle: what are the best alternatives?. The Guardian. 7 November 2013 [4 September 2014]. ^ Crowder, Phillip; Crowder, David A. Creating Web Sites Bible. John Wiley & Sons. 2008: 16. ISBN 978-0-470-37259-3. ^ Dudenredaktion (o. J.). „Homepage“ auf Duden online. Dudenverlag. [13 June 2017] （德语）.